From the only tropical rainforest in the United States to marvels of human engineering in the midst of urban landscapes, here are TripSavvy's favorite parks and gardens for 2018. The El Yunque National Forest is the only tropical rainforest in the national forest system. At nearly 29,000 acres, it is one of the smallest in size, yet one of the most biologically diverse of the national forests hosting hundreds of animal and plant species, some of which are found only there. Ample rainfall creates a jungle-like setting — lush foliage, crags, waterfalls, and rivers are a prevalent sight. The forest has a number of trails from which the jungle-like territory's flora and fauna can be appreciated. For well over a century, people have flocked to this verdant, peaceful garden, which neighbors the Brooklyn Museum. The garden is perhaps best known for its spectacular cherry blossoms and the atmospheric annual Sakura Matsuri that takes place during cherry blossom season. Of course, blossom season is brief and there are numerous reasons to visit the garden throughout the year. Highlights include the large rose garden, the interactive children’s garden, Japanese hill-and-pond garden, conservatories with bonsai, succulents and other indoor collections. Lan Su Chinese Garden is right in the heart of old town Portland, but as soon as you step inside, you’d never know it. This oasis of a garden is the perfect place to unwind for an hour or two. While the space is small, it packs in a lot of culture and beauty. Wander the garden, take in the details, and stop by the koi pond and gift shop. Sip some tea in the tea room and listen to traditional Chinese music, or even learn a bit about Chinese calligraphy. Special events take place regularly too, but mostly come here to just take in the stunning beauty of the gardens and traditional Chinese buildings within. Kirstenbosch Botanical Gardens covers 528 hectares of land beneath Cape Town’s Table Mountain. Part of the UNESCO-recognized Cape Floristic Region, some of it is carefully cultivated into magnificent beds and borders; while the rest is a riotous tangle of natural forest and fynbos. You can explore this South African Eden via a network of trails or the new Canopy Walkway. Keep an eye out for indigenous wildlife, and for art installations including life-sized tin dinosaurs in the Cycad Amphitheatre and majestic Shona sculptures. Just two miles from the hustle and bustle of downtown Columbus is an oasis otherwise known as the Franklin Park Conservatory. Home to over 400 plant species (and a permanent Dale Chihuly glass exhibit), the conservatory is must-see for any visitor of Ohio's capital city. Its exhibits are separated into different climates and regions, including the Himalayas, the rainforest, the desert, and the Pacific Ocean. One of the conservatory's biggest draws is its annual butterfly show, which features over 2,000 tropical butterflies throughout the gardens. You’ll never look at cacti the same way again after visiting the 140-acre Desert Botanical Garden. In this environment, every plant represents stunning beauty. Five marked trails, such as the Sonoran Desert Nature Loop Trail, capitalize on views (whether of mountains or flowers) and fragrances. Learn how native ancestors and current ethnic groups survived in the desert climate by traveling along the Plants & People of the Sonoran Desert Loop Trail, which documents Hispanic, Tohono O’odham and Western Apache people’s connection to plants. If you think the Bronx is all high-rises and crowded streets, think again: it's also home to Wave Hill, 28 acres of pure outdoor beauty along the Hudson River. The estate's multiple gardens include the Herb and Dry Garden, Conifer Slope, Abrons Woodland, and various flower gardens. The Conservatory includes the Tropical House and the Cactus and Succulent House, while the Elliptical Garden is in the former swimming pool of the estate. And don't miss the Wild Garden, which offers sweeping river views thanks to being at the estate's highest point. There is one view of Manhattan that’s iconic beyond all others, in countless rom-coms and photographs and TV moments, straight out onto the downtown skyline, with the Brooklyn Bridge arching over the river. And that’s the view from Brooklyn Bridge Park. On the Brooklyn side of the East River, the park has recently undergone a complete rehabilitation, such that there’s now more than a mile of walkable waterfront. There are playgrounds and basketball courts, eateries and food stands, and landmarks like the beautiful Jane's Carousel, first opened in 1920. Set in the heart of San Diego, Balboa Park is an extensive recreational area and one of the oldest urban parks ever created in the United States. 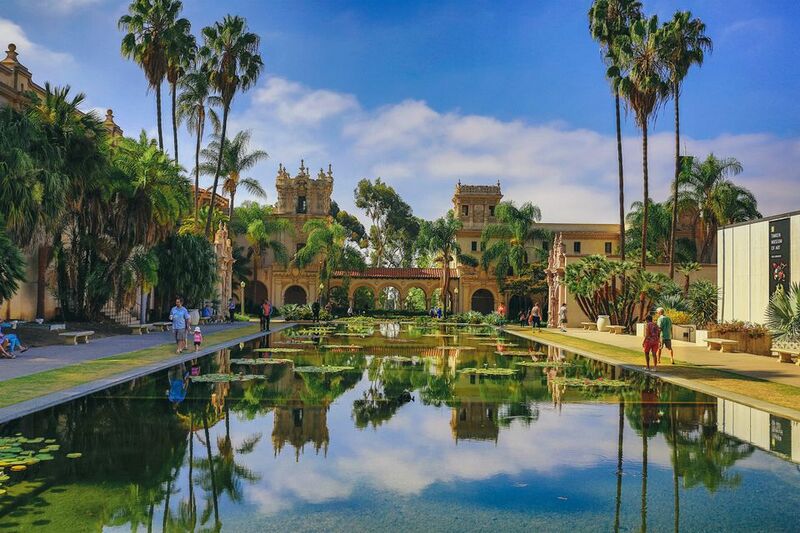 More than a simple outdoor space, Balboa Park is home to some of the city’s best museums, a botanical garden, a timeless organ pavilion and even the San Diego Zoo. Many of the Spanish Colonial-style buildings date back to when the park was used for the 1915-16 Panama-California Exposition. The unique architecture and world-class cultural attractions make the park one of San Diego’s most beloved destinations.